In his speech, James thanked Kansas City voters for their turnout in the midterm elections. Seventy-six percent of Kansas Citians voted “yes” to building a new terminal, which ultimately made the project possible. Voice of the Kansas City Chiefs Mitch Holthus emceed the ceremony, which featured representatives from the Kansas City Aviation Department, Southwest Airlines and the Greater Kansas City Building & Construction Trades Council. Among other notable speakers were Edgemoor’s managing director, Geoff Stricker, and Greater Kansas City Chamber of Commerce CEO Joe Reardon. Edgemoor — alongside Clark | Weitz | Clarkson and architect Skidmore, Owings & Merrill — will head the Build KCI project. As part of its Development Pledge, the KCI-Edgemoor Airport Project has created several initiatives to prominently feature women- and minority-owned businesses. So far, Edgemoor has tapped nine minority- and women-owned firms to lead demolition, abatement and early start work on the new terminal. Mayor Sly James and project participants break ground at Kansas City International Airport’s Terminal A. Furthermore, 55 percent of contract dollars of the $1.5 billion project will go to certified KC-based minority- and women-owned businesses, and of the new terminal’s construction workforce, minority-owned businesses account for 20 percent and women-owned for 15 percent. Edgemoor offers training for its partners through its KC Strategic Partnership Program, a six-month intensive professional development course for small business owners as part of the firm’s Terminal Workforce Enhancement Program. The courses provide project management skills and business fundamentals to position participants’ companies for growth. 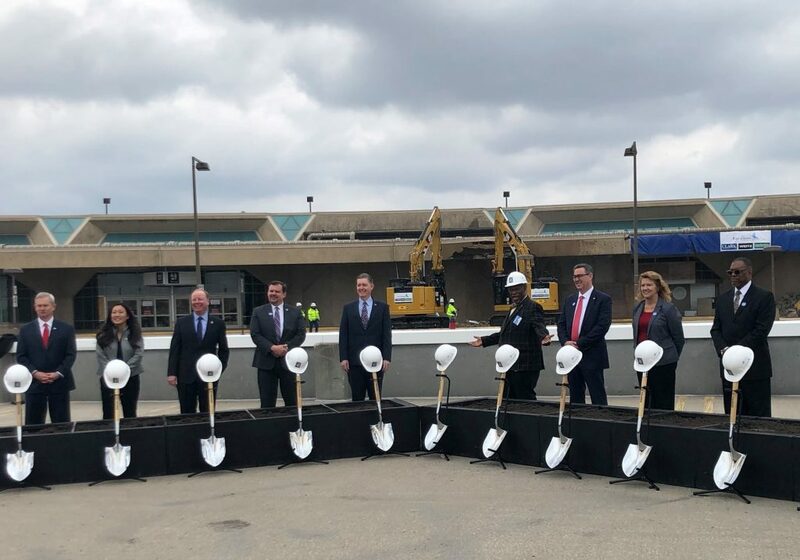 “(The KCI project) will spur economic development throughout the region, elevate the capacity of minority- and women-owned businesses, and thanks to our first-of-its-kind labor partnership, it will build the workforce of Kansas City’s future,” Stricker said. “Kansas City will compete against peer cities with a new set of civic assets that will allow our city again to be the Paris of the Plains, as it was in Kansas City’s heyday,” Graham said. Following the speeches, James used heavy machinery to knock off pieces of the Terminal A building, formally beginning the demolition and construction process of Build KCI. The project is expected to be completed in 2023.